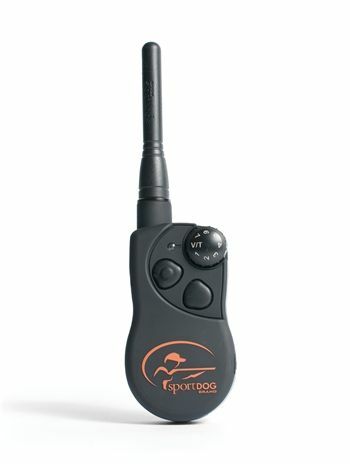 This transmitter can be used to replace a lost or broken transmitter for Remote Field Trainer SD-825 system. This replacement transmitter lets you turn your multi-dog unit into 2 smaller systems. Keep in mind that each collar can only be matched to one transmitter at a time. Includes antenna and lanyard. Charger not included. All parts and labor are covered under warranty for the first two years of the life of the product. Thereafter, there is a minimal service charge for there pair or replacement of the product. Misuse, loss, damage by pet, or improper handling is not covered and may void your warranty. SportDOG Brand will not pay for loss of time, inconvenience, loss of use of your product, or any incidental or consequential damages. Proof of purchase is required to determine time period covered under warranty. Warranty is voided if product is resold or purchased from an online auction site or other non-authorized dealer. There is a 30 day return policy for purchases made from the SportDOG website. Please register your product in our database by mailing in the registration card or register your product online. WHAT IS COVERED: Radio Systems Corporation d/b/a SportDOG Brand® (hereinafter referred to as “SportDOG Brand®”) warrants to the original retail consumer purchaser, and not any other purchaser or subsequent owner, that its SportDOG Brand® product, when subject to normal and proper use, will be free from defects in material or workmanship for a period of two (2) years from the purchase date. An “original retail consumer purchaser” is a person or entity who originally purchases the product,or a gift recipient of a new product that is unopened and in its original packaging. When serviced by SportDOG Brand® Customer Service, SportDOG Brand®covers labor and parts for the first two years of ownership; after the second year, a service or upgrade charge will apply relative to replacement of the product, with new or refurbished items at SportDOG Brand’s® sole discretion.The limited warranty is non-transferrable and shall automatically terminate if the original retail consumer purchaser resells the SportDOG Brand® product or transfers the property on which the SportDOG Brand® product is installed. In the event of defect, these are your exclusive remedies.